The University of Winnipeg campus will provide you with the ideal atmosphere for your delegates to exchange ideas, meet challenges, team- build, network and innovate – all in a dynamic learning environment. 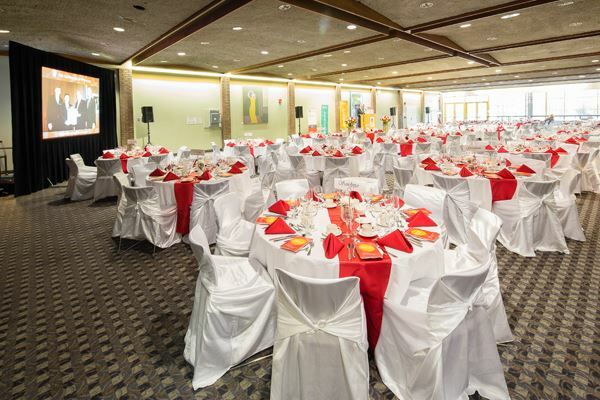 With modern conference and event facilities, award winning catering, and affordable accommodation UWinnipeg is the ideal setting for your next event. Our diverse venue creates the foundation for the perfect event from small groups to gymnasium-sized events. Our expert staff is waiting to assist you in pulling all the elements together to ensure a successful, enjoyable event. 5 studios ranging from approximately 1200-1600 sq ft each are available for rehearsals, dance, mime or other activities. Each space is equipped with sound, computer and video playback. These are not lecture spaces but can be equipped with chairs and tables for lectures or rehearsals. Most large studios have sprung floors, and a few come equipped with lighting. 3 additional smaller rehearsal rooms without sprung floors are also available and range from approximately 450 to 750 sq ft. This fully equipped black box theatre can function in alley, proscenium thrust or in-the-round configurations. Standard configuration includes stock lighting, sound, drapery and seating for 155 with balcony. This historical room is located on the 2nd floor of Wesley Hall, the oldest building on campus dating back to 1896. The hall has a traditional academic aesthetic, complete with a balcony. This is UWinnipeg’s premiere athletic facility. A full gymnasium and athletic centre, fit for sporting events, or large gatherings. Changing rooms and washrooms are included in the rental price. Located on the 3rd floor of Centennial Hall, this theatre is an ideal setting for a concert or dramatic performance. The venue is equipped with an in house sound system and basic stage lighting to accommodate your technical needs.